of courage, personal integrity and human compassion. I was working on a Sunday earlier this year and was surprised to see a small podium erected close to the door of the production company at which I was based. Curious about the insistent banging noise that began at 11am and carried on until it was as loud as the sound I was working with, I poked my head outside. I saw a procession of Veterans (capital 'V' fully intended) from World War II marching slowly to a strident drumbeat. These men were bent, furrowed and wizened, some needing canes and frames to move slowly forward. I remember a six foot four gentleman walking with a grace and poise that made me think he'd been born with a natural commanding presence (either that or a spine of adimantium). It gave me a palpable sense of joy to hear robust applause as these men walked by. There were bystanders of all ages lined along the route and they were all clapping. They weren't mindlessly cheering but simply (and powerfully) clapping. It was a moving display, a measure of respect and gratitude. Without men (and women) like these men (and women), Britain might be a very different place today. I cannot emphasize the word 'different' enough. Oh, such an ordinary word for, let's see… a suffocating Nazi regime under which certain factions would be prejudiced against and casually put to death. Let's not be coy. From 1939 for six long, terrifying years, people believed that their way of life was worth risking death and in some extreme cases, courting it. Make the leap to today. I can't see the same selflessness anywhere (maybe in the movies…) I imagine that to today's youth, the great W.W.2 is just a history lesson, a footnote in their everlasting and instantly gratified lives. They would only know Nazis as two dimensional first person shooter fodder from Wolfenstein 3D. Generations away from the horror of warfare, 2005's youngsters (logically) cannot empathise with that horror (even if they have seen Saving Private Ryan) but at the very least we – collectively as a society – can still show thanks to those who lived and fought through it. For years I have lived with the title Battle of the River Plate in my head and mused what kind of a battle it was but never went to the trouble to find out. It was quite a shock not that long ago (and it should really have been longer ago) that I discovered that the movie based on real events was an Archers' production (shame on me). After a false start of a viewing under very trying circumstances, I re-watched with no interruptions and came to the conclusion that The Battle of the River Plate was a sterling war movie. And its most interesting character (you have got to love Powell and Pressburger) was the principal German. 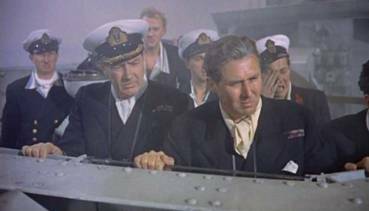 So the Graf Spee sinks a ship and a few years before his immortal turn as Connery's 'M' in Dr. No, Bernard Lee, resplendent in shorts and long socks, takes issue with his captors. He finds the captain (played charmingly by Peter Finch) fair and respectful. A thought passed through my mind at this point (short trip, perhaps). What would have World War 2 been like if the Nazis were just the twin of the 'fair and above board' Brits? What if all the Nazis had Langsdorff's sense of fair play, his honour and his basic decency? The great World War 2 would probably still be raging. Now there's a scary thought. Langsdorff is generous to Lee's Capt. Dove showing him the way in which the Graf Spee is able to operate. He is so overtly generous, I smelled a rat but was quite gratified to find out it was a phantom stench and that this extraordinary German was this noble after all. He even arranges for the trapped officers to enjoy a typical German Christmas celebration. Nice to see TV regulars popping up (Nigel Stock as one of the Graf Spee's prisoners and at his commander's elbow silently assisting is Steed himself, Patrick McNee. Perfectly cast as a padre giving the last rites is John Le Mesurier). Enough of the who's who. The Graf Spee is sinking merchant ships and that can't be tolerated. Enter the three warships, (Ajax, Exeter and Achilles). In an extraordinary coup de prescient strategy, Commodore Harwood (a finely judged performance from Anthony Quayle) pre-empts the Graf Spee's movements and plans to be sitting waiting for her as she sizes up her next attack. One of the enthusiastic sailors searching the horizon for tell tale smoke signs is played by Donald Moffat (it's his first film role and he's uncredited) Moffat is an outsider favourite (who can forget his couch scene in The Thing or his raging against the fates as Lyndon Johnson in The Right Stuff?). Let battle commence. We are afforded many points of view of the engagement as those suffering on the German ship are the British prisoners. Hardest hit is the Exeter captained by John Gregson. He's the sort of British actor who embodies his nationality and infuses it with a sense of gentle humour in the face of enormous adversity (his ship was almost sunk in the battle). In short, he makes you proud to hail from these shores which given the sorry state the world is in now is nigh on miraculous. It's also a miracle he survives a direct hit on his own conning tower but then, that's on record. In 1956, most of the special effects were achieved with intricately built models. Powell stages most of the action for real (you get a great sense of scale of these beasts. Someone's Navy must have been hugely cooperative). He only resorts to models when needing to blow things up. Water, a special effect nightmare, cannot be miniaturised so is always the giveaway but given that, the effects stand up quite well. It's clear that the conning tower shots utilise back projection but it's not hugely noticeable. The acting is so much fun, your eyes never really stray. When Harwood receives the Morse code telling how the HMS Cumberland managed to get to their location in record time, the movie lights up in Quayle's eyes. Fleeing to make repairs, the Graf Spee harbours in Montevideo in Uruguay (why can I not get Homer Simpson out of mind whenever I hear that country's name?). It's a neutral country and suddenly the cornered captain Langsdorff starts a diplomatic offensive trying to evade the British warships on his way out of harbour. The tension ratchets up due to the fact that this was one of the first instances of history unfolding on live radio (an American journalist gave a running account of proceedings as they happened). 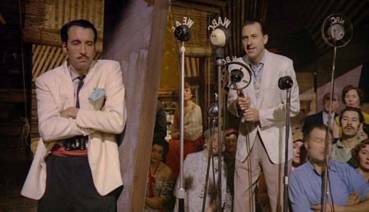 Also Christopher Lee pops up as a Uruguayan barkeep and I was reminded of his extraordinary career by virtue of my last two reviews (movies almost fifty years apart) and both featuring Christopher Lee. I hope he lives forever. It is a matter of historical record what happens to the Graf Spree and Langsdorff's final decision but I still won't spoil it for those new to the movie. It's well worth taking a look for yourselves. 1.85:1 letterboxed, it's a really first rate transfer. There was a shot in the first third of the movie (the re-fuelling supply ship intercepts the Graf Spee) that looks (and forgive me) for all the world like a computer generated shot (it's just so clean and so perfect). The reason for its cleanliness and perfection is that it was shot for real so is therefore clean and perfect. The print is nigh on spotless and the grain hardly noticeable. The Dolby 2.0 soundtrack faithfully recreates the 50's mono final mix. As with nearly all the discs in this package, there are no sound issues. Solid Mono. Subtitles are present and correct. Hah! Extras, schmextras. Profiles of those creatives involved (Powell, Gregson, Finch and Quayle). OK but no Havana. In fact it says 'Cast Biographies' and includes Powell which is a little odd.